Did Treasury Fire Jim Freis for Showing that Banksters Are a Bigger Problem than Terrorists? 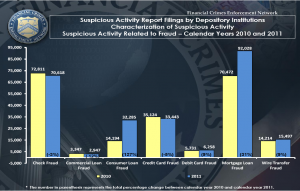 Three days before he was fired, FinCEN released this report, showing in aggregate what all of last year’s Suspicious Activity Reports revealed. It shows that among the SARs from depository institutions (which make up over half of all SARs), reports of terrorist financing and hacking (computer intrusion) are going down, while reports of behavior targeting consumers–mortgage and consumer loan fraud–are going up (though it notes the mortgage loan fraud reports are inflated because some date from years ago). Reports of Terrorist Financing declined 14%, from 711 instances in 2010 to 609 for the same period in 2011. Of the eleven reportable suspicious activities that experienced decreases, none saw greater than Computer Intrusion, falling 21% in 2011 as compared to those filed in 2010. For the second year in a row, this drop is amongst the largest of any of the defined summary characterizations. Though having experienced decreases in 2009 and 2010, the number of reports indicating Consumer Loan Fraud (in whole or part) significantly rose in 2011, up 127% from the prior year. Such trends are similar to what the report shows in the securities and futures industries, with an even bigger drop in terrorist financing and big gains in futures fraud, embezzlement, and insider trading. Embezzlement/Theft saw the second largest gain of any of the suspicious activities reported in SAR-SF filings, rising 38% in CY2011. 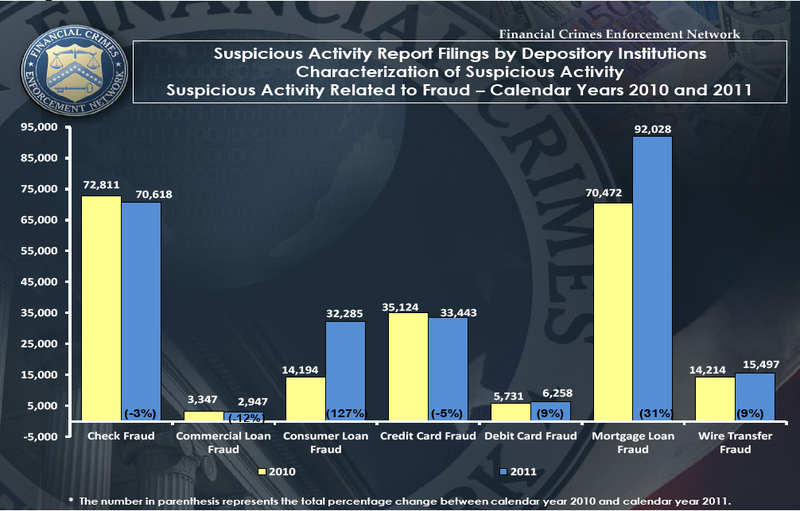 However, of the 21 Types of Suspicious Activity listed, Futures Fraud saw the biggest rise (up 85%) for the same year, increasing from 20 instances in 2010 to 37 instances in 2011. Likewise, Insider Trading (+34%) and Forgery (+19%) also experienced double-digit growth, making them the only two distinct activities that have continued to rise every year since 2003. Of those activity types showing a decrease, Bribery/Gratuity (down 74%) and Terrorist Financing (down 59%) both saw a sizeable drop between 2010 and 2011, with the former down from 69 reported instances last year to just 18 in 2011 and the latter falling from 46 instances in 2010 to a low of 19 twelve months later. Remember, SARs are not a reflection of what Freis demands (nevermind the fact he’s been on the job when things like terrorist financing were higher). Rather, this is what banks and securities firms self report, as mandated by law, about what they’re seeing in their own records. Jim Freis showed that terrorism is getting better and bankster crimes are getting worse. And then Treasury fired him. And the report from American Banker suggests that by replacing Freis, Treasury may intend to have FinCEN dictate what financial institutions prioritize. Which will mean terrorism–and not the crimes of banksters–will once again be the focus. Fincen is likely to take a higher profile when it receives new leadership. In the immediate aftermath of the Sept. 11 attacks, Fincen was very active in dealing with bank regulatory matters, including helping to shape policy on anti-money laundering requirements. But the financial crisis largely pushed Fincen to the side and the agency focused on many of its other responsibilities. Treasury appears to want Fincen to take a larger role in terrorist financing activities and possibly reassert itself in the bank regulatory sphere. In past few years, banks have not had to focus on what Fincen’s agenda was. A more assertive Fincen changes the equation. FinCEN offers one objective read of the relative prevalence of various forms of financial crime. And last year, it showed that banksters were a growing problem and terrorists a shrinking one. And that message was so dangerous to the powers that be, it appears, Treasury decided to kill the messenger. https://www.emptywheel.net/wp-content/uploads/2016/07/Logo-Web.png 0 0 emptywheel https://www.emptywheel.net/wp-content/uploads/2016/07/Logo-Web.png emptywheel2012-05-31 18:53:392012-05-31 23:11:54Did Treasury Fire Jim Freis for Showing that Banksters Are a Bigger Problem than Terrorists? I can’t say this enough. Because something will help people understand this more. Everyone should really read: Treasure Islands: Uncovering the Damage of Offshore Banking and Tax Havens by Nicholas Shaxson. The big banks really aren’t much better than criminal syndicates. And to add, the banksters have been a growing problem since the days of JFK. And it will only get worse unless someone has the guts, not “Turbo Tax” Timmeh obviously, to put the screws to them. @Phil Perspective: Told ya it was good. Though credit where it’s due, Yves told me how good it was. That is exactly what they have become. All if them could be prosecuted under RICO in a heartbeat. No will. @emptywheel: Yep. Treasure Islands is excellent, including Shaxson’s suggestions for further reading. One takeaway I haven’t seen much in print is that the US vies with London’s financial district as the greatest venue for laundering money. Seemingly, the US markets its ability to launder money from non-US customers. One would think it wouldn’t take many cutouts for a US-based wealth merchant to take advantage of those attractions. The money isn’t so much as hidden (much of it is, especially through English law-derived trusts), as untaxed, by tacit agreement with the countries who thereby lose the revenue. Principal sources of money to hide come from purportedly illegal trade in arms, drugs, people and money. Another takeaway is the more traditional one, again little talked about. That is, the loss to third-world countries when privileged political and business elites monopolize the extraction of domestic resources, then “hide” their revenues and profits offshore to escape tax, which drives those countries deeper into debt and thralldom to foreign banks, corporations and “development” agencies. That business model, once reserved for the Congo, seems to be coming to an American theater near you. Remember back when king gwb the lesser went to England? The potus wanted to drive his traffic stopping car train through the heart of London. The answer from the $$$$ gods you’ll drive around if you know what good for you and the potus did. @Tom in AZ: As Shaxson has pointed out, they have been for a long time. And I’m pretty sure they outright control the Tories in London. @emptywheel: It’s very good!! I missed Yves’ recommendation. I saw Matt Stoller Tweet about it. And my local library had it, of all things. What’s even more interesting is how London, and Jersey(a British Crown Dependency), play a huge role in the power of the banksters. @earlofhuntingdon: Not only that, but remember Tony Montana? Remember where he first put his money? Do you really think the big banks turn down the opportunity to handle money like that, even from illicit sources? Of course they don’t!! After all, JP Morgan was dealing with Iran even though they knew it would get them in trouble(which they got a slap on the wrist for). @P J Evans: And I think the UK, on the whole, was never too fond of the Shrub. Certainly after Iraq they weren’t. Probably didn’t feel like dealing with the public outcry for inconveniencing the people for his whim. I haven’t been fond of the Shrub since, oh, 1994. (Voted against him, three times.) Didn’t vote for his father, either (his father is considerably brighter). The only thing spinning faster than those Iranian centrifuges is the Team Obama 2012 campaign staff hyping Obama’s foreign policy chops. Earl,did you by chance watch any of the very recent Congressional hearings on Law of the Sea treaty ? May 23, 2012 – The United Nations treaty that governs the world’s oceans is undergoing one of its periodic resurrections in Congress. Great work yet again EW.